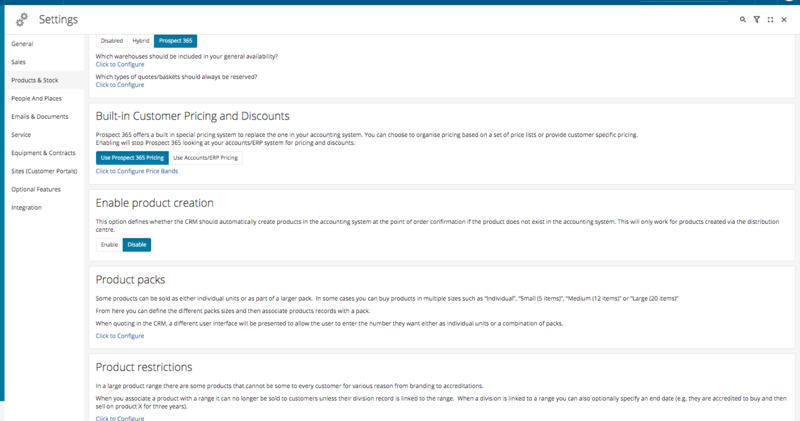 This article outlines how to configure your product restrictions within the CRM. Product restrictions can be really useful in a number of distribution or manufacturing scenarios to ensure you sell the right products to the right customers. For more information on how product restrictions could help your business take a look at our 3 Reasons why you should use Product Restrictions article. 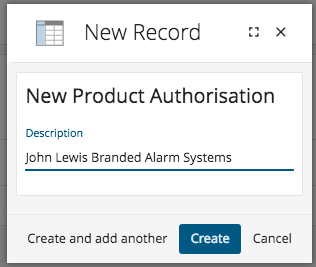 To configure your Product Restrictions you will require Prospect 365 Administrator rights, if you require these then please speak to your key CRM user or our Customer Services Team. To edit your Product Restrictions, click on the settings icon in the bottom left-hand corner. Once within the Settings Centre, navigate to the Products & Stock section & scroll down until you reach the Product Restriction configure option. By selecting the 'Click here to Configure' link the Configure Product Restrictions window will open. Within this window all of your current Product Restrictions will be listed. To add a new one click on the + icon in the top right-hand corner. You will then be asked to give the Product Restriction a description. Please make sure this is relevant to the scenario where this will be used, so everyone understands when this restriction should be applied. Click create. You have now configured your new Product Restriction, for more information on how to use your Product Restrictions within the CRM please see the Using your Product Restrictions article.